Learn and be inspired by the fascinating true stories behind 10 leading lights in black enterprise today . . .
* While she won't share the formulas for her world-renowned hot sauces, Vivian Gibson, CEO of The MillCreek Company, is glad to impart her recipe for transforming a passion for cooking into a multimillion-dollar enterprise. * He went from sleeping in Central Park to heading a major film production and syndication company. Get the details on how Frank Mercado-Valdes's love of classic black films led to the creation of the African Heritage Network. * At only 34 years old, Alonzo Washington is head of his own comic book publishing empire. Find out how this committed political activist used his genius for cartooning to promote minority causes and make a fortune doing it. 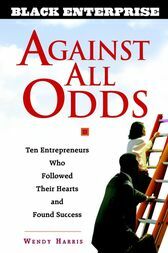 Discover the compelling true stories of how these and seven other African-American men and women beat the odds to become some of today's most successful black entrepreneurs.In a series of intimate profiles, journalist/author Wendy Harris details the paths they traveled, the obstacles they overcame, and the important lessons they learned along the way about what it takes to succeed in business. WENDY HARRIS is a former small business editor of Black Enterprise magazine and the author of the Black Enterprise Guide to Starting Your Own Business (Wiley). She has written feature articles on topics such as creating your own business plan, marketing and promoting your small business, and choosing the right employees for your business. Prior to her work at Black Enterprise, Harris wrote for the Philadelphia Tribune and the Philadelphia Inquirer.